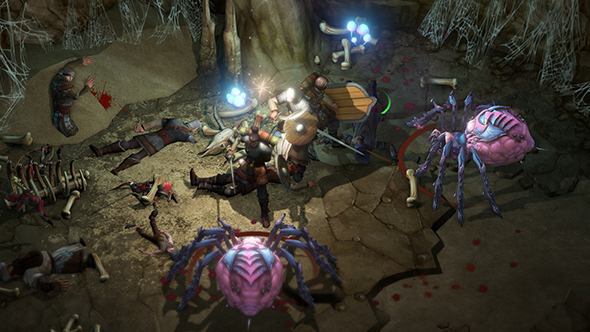 Update, July 22: Pathfinder: Kingmaker is set for release September 25th, publisher Deep Silver has announced. While third edition Dungeons & Dragons has a storied history in videogames ranging from the Temple of Elemental Evil to Neverwinter Nights, the ruleset’s successor has yet to get a full conversion to a digital role-playing game. That’s about to change with Pathfinder: Kingmaker, and developers Owlcat Games have provided an updated look at the game. Set in the Pathfinder world of Golarion, Kingmaker – loosely based on the adventure path of the same title – will introduce you to characters new and old as you take command of a kingdom in the Stolen Lands and shape its future. You can claim territory from bandits and monsters and rebuild villages with specific structures, and parts of your kingdom will eventually take on a moral alignment as they grow based on your actions, letting you become a friendly king or a slightly less nice tyrant. Check out all the best RPGs on PC. You’ll be joined by 11 party members with unique backstories, and don’t worry – you can bang them. Er, romance them, at least. For your character there are seven race options, and 14 classes with up to three different archetypes each, ensuring maximum potential for customization. There are “over 1,000” spells and abilities. The world will also keep changing with a day and night cycle, seasonal rotation, and a weather system. There’s now a Steam page up for Kingmaker, and pre-orders are open. There are four editions to pick from, with the price increasing with the number of included extras. The top tier Imperial Edition includes a season pass, a red panda in-game pet, and a digital Pathfinder adventure module by RPG heavyweight Chris Avellone. This is the first project from developers Owlcat Games, though individually they have experience in making RPGs going back for two decades. The biggest name on the credit list is narrative designer Avellone. Pathfinder: Kingmaker successfully cleared Kickstarter with just over $900,000 last year, and is set for release September 25th on Windows, Mac, and Linux PCs.